Roger Gilbert, left, and Ernie Madden prepare meals for soup kitchen. The Pilot/Evelyn CookThere’s a story in the Bible about a rich young man who asks Jesus what he has to do to gain eternal life. Jesus tells him to obey the commandments. The man says he already does that, and wants to know if there’s anything else. The young man went away sad, the story concludes, because he had great wealth and didn’t want to give it up. A modern version of the tale, with a different ending, had a role in bringing about Brookings’ two, free-lunch venues, a free medical clinic and a free catering service, plus an organic community garden that’s still in the planning stage. He used the $2,000, he said, to relocate from Sacramento to Brookings five years ago. He gave up the restaurant he owned, bailed out of his real-estate career, and turned his back on the high-maintenance, stressful, materialistic lifestyle he’d lived for years. He now subsists on Social Security and food stamps. “I just want to follow Jesus. My mission statement is simple: feed the hungry, cure the sick, give hope to the hopeless,” Gilbert said. With the help of his business partner and good friend, Ernest Madden, he established the clinic and lunch program at St. Timothy’s Episcopal Church. He cooks for that program as well as for the one Madden started at the Seventh-day Adventist Church. “It’s gourmet food, and it’s for the whole community – anyone who wants to come is welcome, anyone who’s hungry,” he said. Because there has been such a tremendous outpouring of support for the kitchens through donations of food and money, Gilbert said he and Madden were inspired to show their gratitude to the residents of Brookings and Harbor by providing a catering service that prepares and delivers gourmet meals, free of charge, to community organizations. They’re calling the new service “2 Chefs Catering,” he said. “I’ve always wanted to do something for other people without expecting anything in return,” Madden said. Madden, who did restaurant work most of his life, is now retired. Madden, who’s originally from Philadelphia, is married and has two kids from a previous marriage, he told the Pilot. He said he has never been a full chef, but worked many years as a prep cook. “I started as a dishwasher, then learned from the prep cooks and worked my way up,” he said. “I worked for gourmet French and Italian restaurants in Bellingham, Wash.,” he said, as well as for other establishments over the years. He has been doing restaurant work since 1960 or ’61, and is a Vietnam veteran. Much to Gilbert’s surprise, the woman who famously popularized French cooking in America gave him a call. “We chatted, and she asked me over to her house to have tea,” Gilbert said. “I went to see her, we had tea, and then we cooked together in her kitchen for four hours straight, nonstop. Gilbert worked behind the scenes as Child’s prep cook, learning all he could about French cooking. Child recommended him for a job at a French restaurant in Florida. Gilbert saw combat in Vietnam, and mustered out in San Francisco, where he worked for 12 years at a French restaurant, thanks to a recommendation from Child. He said he was married and helped raise three children, and is now single, which he says gives him more time to indulge his passion for cooking and ministry. “I love cooking. I love feeding people. I love people,” he said. Madden said Gilbert feeds most of the people in the apartment complex where he lives. Gilbert’s front door is always open so friends and neighbors can wander in whenever they feel like it. When they do, they usually get fed. Gilbert said it’s amazing how the community has gotten behind what he and Madden are doing. So much food has been donated, he said, it’s a full-time job trying to give it all away. He has a fully-stocked refrigerator outside on his front porch posted with a sign that invites people to help themselves to the contents. “I put it out there so they can take whatever they want, whenever they want, without having to ask,” he said. The pantry and closets in his home are stuffed with donated canned food because he doesn’t have anywhere else to store it. As fast as he gives it away, more arrives. Gilbert and Madden are planning an organic community garden. They’ve lined up a location, and some volunteer master gardeners have agreed to teach organic gardening there. 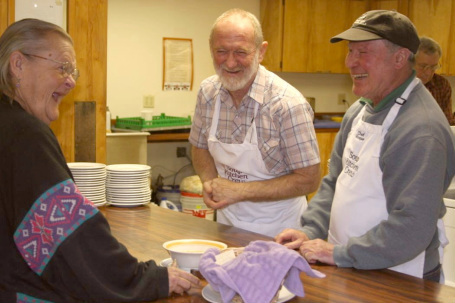 Pat Fitzgerald, left, is served lunch at St. Timothy’s Soup Kitchen by volunteer dishwasher Ira Tozer and volunteer chef Roger Gilbert. The Pilot/Evelyn CookWho says there’s no such thing as a free lunch? Two soup kitchens in Brookings dish up meals at noon on Mondays and Tuesdays each week that are not only free of charge, but also tasty and healthy. “We try to make sure the food is both nutritious and delicious,” said Roger Gilbert, who helped get the two soup kitchens started and volunteers as a cook for both. Lunch is served at the Seventh-Day Adventist Church, 102 Park Ave., on Mondays, and at St. Timothy’s Episcopal Church, 401 Fir St., on Tuesdays. Though both meals are housed in churches, they’re nondenominational, Gilbert said. “They have nothing to do with religion or politics,” he said. “No one is allowed to come in here to preach, or to talk politics. If they do, I ask them to leave. That’s not what we’re about. We’re here to help people,” he said. Currently, the two lunch programs combined serve about 100 meals per week, Gilbert said, but an expansion is in the works, he added. “My dream is to get enough churches involved so we can have a kitchen open every day where hungry people can get a hot, good-tasting meal,” he said. But before that can happen, he added, more community support is needed. “We always need volunteers, and donations of cash and food – fresh, frozen and canned,” Gilbert said. He said he and his partner, Ernest Madden, got the idea to start a soup kitchen five years ago, but it took them three years to get it off the ground. They opened the first one at the Seventh-Day Adventist Church in June, 2009, and the second at St. Timothy’s in the fall of that same year. The Seventh-Day soup kitchen serves vegetarian meals, while St. Timothy’s offerings almost always include meat, he said. “We’re positioning ourselves to be able to feed the entire population of the cities of Brookings and Harbor, just in case that should ever become necessary. “Every week, we’re getting more and more people coming for lunch. When the first kitchen opened, we’d get about ten people a week. Now, between the two, we’re averaging about 100 a week. Contrary to what most people might think, he said the majority of those who patronize the soup kitchens are not the traditional homeless. “Every week, we’re getting more and more homeless, but they’re what I call the new homeless – middle class people who can’t keep their homes because they’ve lost their jobs. “They’re living in their cars, in RVs, in tents. But the majority of those who regularly eat lunch at the soup kitchens are not homeless at all, he said. “Our biggest group is mostly seniors. They cherish having a safe, clean place where they can eat a gourmet meal and meet with their friends,” he said. Gilbert said the two kitchens always serve a substantial, well-balanced hot meal for lunch – not just soup. “That way, if they only get to eat one meal a day, they could make it on the meal we serve,” he said. Roger Gilbert and Ernest Madden prepare food for their soup kitchen program in Brookings. The Pilot/Marjorie WoodfinThere is an old saying, “There is no such thing as a free lunch.” But Brookings residents Roger Gilbert and Ernest Madden are living proof that the adage doesn’t apply to Brookings-Harbor. The two men, with help from their friends and support from churches and other groups, are working to help serve free gourmet meals three days a week. If there is a “Soup Kitchen” sign on display outside of the Seventh-day Adventist or St. Timothy’s Episcopal churches or His Haven of Hope, it means free food is being served to anyone who is hungry. Rich or poor, permanent resident or just passing through, all are welcome to enjoy a gourmet meal. Gilbert and Madden hope to expand the program to five days. Free lunch is served from 11 a.m. to 1 p.m. on Mondays at the Seventh-day Adventist Church, 102 Park Ave., and on Tuesdays at St. Timothy’s Episcopal Church, 401 Fir St. On Fridays, the dynamic duo join with friends from the Outreach Gospel Mission to serve dinner beginning at 5:30 p.m. at His Haven of Hope, 702 Chetco Ave.
“And, we serve gourmet meals,” said Gilbert, who was a professional chef for 30 years in Sacramento before he moved to Brookings in 2005. Gilbert, who was only semi-retired when he moved to Brookings, worked for Fred Meyer for three years before really retiring, and began working on his dream of providing free food for all. During that first three years he met Madden, who was active in the Curry County Homeless Coalition and also had a dream of feeding the hungry. The two hit it off like “peanut butter and jelly” and started working together. With the Homeless Coalition Madden was helping just the homeless but, as the two men’s dreams started taking shape, they agreed that they wanted to feed anyone who came to the banquet, needy or not. “Everyone is welcome at God’s table,” Gilbert said. Madden explained that when his 20-year marriage fell apart in 1994, he left Canada and headed for San Francisco, looking for old friends. After 20 years it seemed impossible to find any old friends so he just started driving north. “And the first place I was out of the smog, was Brookings, so I stopped,” he said. Madden understands what it means to be homeless. “For the first year-and-a-half in Brookings, I was homeless, living in my van,” he said. The soup kitchen idea, he said, first took shape at the Seventh-day Adventist Church where women from the church helped to provide three different soups for lunch each Monday. Gilbert was serving free meals at St. Timothy’s when the two joined forces. As lunch was being served recently at St. Timothy’s, it was impossible to tell which of the diners enjoying the warm friendly atmosphere and delicious pasta and trimmings might have gone hungry without the meal. Everyone appeared to be having a great time, laughing, joking and sharing, especially the cheery chefs and their helpers behind the counter. The two men are delighted to provide meals three days a week, but they insist that it won’t stop there. They are looking for new sites, more donations, and additional volunteers to make it possible to feed their clients on Wednesday and Thursday, and to have wheels to allow food to be delivered to those unable to get to the serving sites. “Bernie (Lindley, pastor of St. Timothy’s Church) is going to help us go to other churches to ask for help,” Madden said. Gilbert is proud of the quality of food they serve. “Everything is freshly cooked daily, no canned food, and we take all leftovers go to the mission,” he said. Anyone who would like information, make a donation or volunteer time, can reach Gilbert at 541-251-3653 or Madden at 541-251-0148. There is good news for those in the Brookings-Harbor community who are uninsured and need health care. Health care is available from 1 to 4 p.m. every Tuesday at St. Timothy’s Episcopal Church. A dedicated group of volunteers including a doctor two nurse practitioners, four nurses, receptionists, and other helpers, has established a free health care clinic that opened in July. The Saint Timothy’s Outreach Clinic provides free walk-in health care on Tuesday afternoons with no appointments necessary. Patients will be taken in order of arrival except for the acutely ill, who will be seen first. St. Timothy’s pastor, Bernie Lindley, during a recent tour of the clinic, made it clear that the clinic is community sponsored. “We’re working to heal physical ailments, not to proselytize,” Lindley said. That there is an urgent need for free medical services in the community was evident by the continuing flow of patients in the reception area, nurses station and examination room throughout a recent Tuesday afternoon. All of those involved in maintaining the free health care services at the newly opened clinic are unpaid volunteers, making it possible to provide care without fees. Dr. Lawrence Witt, FNPs Nancy Erb and Trace Kather, nurses Francisca Van Lith, Marydith McCutchen, Rose Weiss and Diane Ross, receptionists Jan Krick and Ellen Castille, website manager Richard Hill, attorney John Babin and other helpers, all generously support the clinic with time and effort. The clinic will provide only acute, basic medical care, such as for infections, flu symptoms, a bad cold, or minor injuries. Although all of the workers are volunteers, there is still need for financial donations to keep the clinic running. In addition to obtaining the $5,000 grant, “Good Sam” employees and volunteers are also planning a fundraising barbecue scheduled for Sept. 26 at their Curry Village facility. Williams explained that the funds raised will be shared by St. Timothy’s Outreach Clinic and to help Curry Village grant residents’ wishes. “We will be serving all you can eat ribs, chicken, beans, potato salad, bread and watermelon from 11 a.m. to 1 p.m.,” Williams said. Curry Village is located at 1 Park Ave in Brookings. Williams noted that, in addition to having a wonderful meal – all you can eat for the price of $10 – diners will also be helping support free medical services to those in need. Anyone without medical insurance who cannot afford to go to the doctor for health care is invited to come to St. Timothy’s Outreach Clinic, on the lower floor of St. Timothy’s Church, 401 Fir St., from 1 to 4 p.m. any Tuesday. For additional information about the free clinic, or to volunteer or make a donation, call 541-469-3314. The free clinic is sponsored by St. Timothy’s Episcopal Church, South Coast Friends, and other community partners. South Coast Friends is a loosely organized group dedicated to serving the community at the soup kitchen, food bank, and other serving organizations, plus distribution of clothing and food to the homeless. An exciting new program has been developed in Brookings: a free medical clinic sponsored by South Coast Friends, a loosely-organized group of local volunteers interested in community service, begun in partnership with St. Timothy’s Episcopal Church, Curry Health Network, and many other generous community members. Especially generous has been Father Bernie Lindley, of St Timothy’s, who has given an enormous amount of time and energy to this project. Also deserving kudos is the congregation of St. Timothy’s, who allowed us to remodel a room in their church building for use as a medical office. This clinic provides completely free medical care for those who would otherwise not be able to afford it. It is no substitute for an emergency room or for an ongoing primary care provider, but is designed to give care to those who have acute, but not immediately life-threatening conditions. Examples of patients who have been treated are a woman with dangerously high blood pressure and a man with an abscessed tooth, neither of whom could afford the doctor’s visit or prescriptions they needed. If someone needs medication but can’t afford it, we help with payment for medication. We have been blessed with grants from St. Matthew’s Episcopal Church in Gold Beach and from the Good Samaritan Society. This money will help us pay for medical supplies, prescriptions, and other ongoing expenses. All care providers and support staff are volunteers working completely for free. I hope other compassionate community members will join us, whether as a care-provider, a support volunteer, or a donor. No one in our community should be ill or in pain without a place to turn.